This is one feature of this blog that I hope to have at least once a month. I hope you enjoy it. 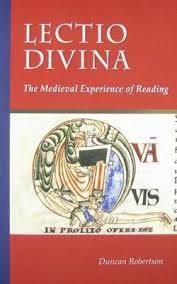 Lectio Divina: The Medieval Experience of Reading, by Duncan Robertson, gets four taus from me! If you are interested in the history of reading, this book is for you. What this book does is explore the development of lectio divina during the Middle Ages. It is carefully researched (obviously, it is a solid scholarly text so if lots of footnotes are not your thing, this book is not for you) taking you through the culture of reading in the monasteries, where monks “chewed” and “digested” the words of Scripture, savoring each word to the rich literature that it produced. It examines the act of interpretation (should it be literal? when is reading into the allegory too much?) and the act of writing (i.e. writing about Scripture will be conducive to devotion). Several chapters are devoted to the development of meditation, contemplation, and prayer, as a product of reading carefully the word of God. A whole chapter is dedicated to how the Song of Songs was read, understood (or at least how Bernard, Gregory, and Origen wrestled with its meaning), and written about. The book concludes with how these practices were integrated in the twelfth century. There is much I appreciate in this book concerning the act of reading. I often encounter a great resistance to read and when reading is done, I find that understanding and interpretation it is superficial and dull. In his last chapter, Robertson asks: “What does this monastic pedagogy have to do with reading in the modern world?” (231). Freedom to pause and think more deeply, to explore, to question, to draw closer to God.